The Federal Deposit Insurance Corporation has the unique mission to protect depositors of insured banks and savings associations. No insured depositor has ever experienced a loss in an FDIC-insured institution due to a failure. The FDIC protects depositors by managing the Bank Insurance Fund (BIF) and the Savings Association Insurance Fund (SAIF). The FDIC also manages the remaining assets and liabilities of the former Federal Savings and Loan Insurance Corporation (FSLIC) and the former Resolution Trust Corporation (RTC) through the FSLIC Resolution Fund (FRF). Once an institution is closed by its chartering authoritythe state for state-chartered institutions, the Office of the Comptroller of the Currency (OCC) for national banks and the Office of Thrift Supervision (OTS) for federal savings associationsthe FDIC is responsible for resolving that failed bank or savings association. The Division of Resolutions and Receiverships (DRR) staff gathers data about the troubled institution, estimates the potential loss from a liquidation, solicits and evaluates bids from potential acquirers, and recommends the least-costly resolution to the FDICs Board of Directors. 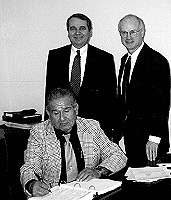 Daniel Bell of the FDICs Southwest Service Center join Russell Welsh (seated), of the Colorado River Indian Tribes, in closing a deal that returned 7,808 acres of California land to the tribes. The deal involved the sale of a company, for which the FDIC was trustee, that held a 65-year lease on the tribal property. The FDICs ability to attract healthy institutions to assume deposits and purchase assets of failed banks and savings associations minimizes the disruption to customers and allows some assets to be returned to the private sector immediately. Assets remaining after resolution are liquidated by DRR in an orderly manner and the proceeds are used to pay creditors, including depositors whose accounts exceeded the insured $100,000 limit. During 1997, the FDIC resolved only one institution, the fewest in one year since 1962. (In 1972, only one commercial bank failed but another received assistance from the FDIC to prevent failure.) Southwest Bank of Jennings, Louisiana, which was insured by the BIF, was closed by the state banking commissioner on November 21,1997. It had total deposits of $26.8 million and total assets of $25.9 million. The FDIC was able to find a bank to assume all of the banks deposits and $20 million of its assets. As assets of failed institutions are liquidated by the FDIC, DRR makes payments, known as dividends, to uninsured depositors and general creditors of failed banks, including payments to the FDIC as a creditor for advancing funds for the payment of insured deposits at the time of an institutions failure. Total dividend payments during 1997 to all creditors of institutions that failed in prior years were just more than $5.3 billion. The FDICs ability to provide incentives for healthy institutions to assume deposits and purchase assets of failed banks and savings associations allows a portion of assets to be returned to the private sector immediately. The remaining assets are retained by the FDIC for later sale, workout or other disposition. At year-end, the FDIC was managing $4.1 billion in assets in liquidation and $7.9 billion in assets not in liquidation, consisting of cash and securitization reserves. The FDIC reduced the book value of the combined FDIC/RTC assets in liquidation by 52.8 percent, to $4.1 billion from $8.7 billion. Net collections for all funds totaled about $3.6 billion. 1,288 real estate properties, which were sold for a total of $320.6 million, yielded a recovery of 102.4 percent of their average appraised value as determined by independent appraisers. 23,207 loans and other assets, which were sold for a total of $845 million, yielded a recovery of 111.3 percent of their average appraised value. failed banks assets as possible, leaving the rest for the division to dispose. With JAM, the FDIC sells pools of assets to banks at the time of closing. As a result, in the one failure in 1997, approximately 79 percent of the banks assets were sold at the time of resolution. In 1997, the Corporation continued to expand its use of the Internet to provide information on upcoming loan and real estate sales. Investors interested in purchasing real estate acquired from failed institutions can now conduct their own Internet searches by property type, state, city, name, and/or market price. Also added in 1997 was a Web site listing properties with environmental conditions, including those with historical or cultural significance or special resources. The FDIC is the limited partner in 40 equity transactions entered into by the former RTC. The RTC contributed asset pools (usually sub-performing loans, non-performing loans and real estate) to the partnerships. The general partner invested equity capital and has responsibility for the day-to-day management and disposition of the assets. Partnership distributions are generally split 50-50 between the partners. During 1997, the FDIC received $302 million in distributions, based on several reports. The FDIC also has limited partnership investments in 29 Judgment, Deficiency, and Charge-Off (JDC) partnerships. The JDC partnerships were created by the RTC in 1993 to place hard-to-collect assets in the private sector, and the FDIC has continued using them. These judgments, deficiencies, charge-offs and small balance assets acquired from failed institutions generally had been written off or determined to be uncollectible by the failed institutions. The RTC contributed these assets to the partnerships in return for the general partners private sector expertise and willingness to absorb the cost of pursuing collections. Collections typically are shared equally between the general partner and the FDIC as a limited partner. During 1997, the FDIC delivered to the partnerships $449 million of assets, which is carried on the FDICs books at a small fraction of the original value. Due to declining deliveries, one partnership was terminated in 1997, eight partnerships have initiated termination procedures and 21 still are actively working to collect on assets. During 1997, the FDIC Affordable Housing Disposition Program sold 37 multifamily and 25 single family properties, consisting of 1,755 units, for $9.8 million. Since 1990, the FDIC and RTC affordable housing programs had cumulative sales of more than 125,000 affordable housing units for $1.8 billion. In addition, 30 state housing agencies and nonprofit organizations, acting under a memorandum of understanding with the FDIC, monitor 93,409 multifamily rental units to ensure that the purchasers are making units available at adjusted rents as specified in the purchase agreements. Once the assets of failed institutions have been sold and the proceeds distributed to creditors, the FDIC terminates the receiverships. During 1997, the FDIC terminated 251 receivership operations, or approximately 19 percent of the open receiverships as of January 1, 1997. Of those, 76 were FRF receiverships commonly referred to as Southwest Plan institutions, five were FSLIC institutions, 21 were RTC pass-through receiverships (where assets and liabilities are passed to a newly created institution while certain claims were retained by the RTC as receiver), and the remaining 149 were BIF or FRF/RTC financial institutions. In addition, a total of 197 receiverships entered into the final stages of the termination process and are expected to be terminated in early 1998. The FDIC has updated its tracking system and centralized the oversight of the receivership program in the Dallas Field Operations Branch in order to terminate receiverships more quickly. The FDIC in December 1997 published a two-volume study on the banking crisis of the 1980s and early 1990s. History of the Eighties Lessons for the Future provides a careful examination and analysis of the crisis, and an evaluation of the lessons learned. The two-year study, spearheaded by the Division of Research and Statistics, determined that there was no single cause or short list of causes for the rise in the number of bank failures during the period.Rather, failures resulted from a number of forcesstructural, economic, supervisory and legislativeworking together at that time. The study is available on the FDICs Internet home page. Top: Former FDIC official Robert Miailovich at the History of the Eighties symposium on the banking and thrift crisis. 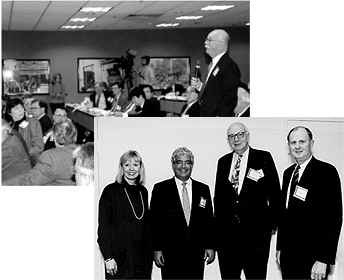 Bottom (l-r): FDIC Chairman Ricki Helfer, former FDIC Chairman William Isaac, former Federal Reserve Chairman Paul Volker, and FDIC Vice Chairman Andrew C. Hove, Jr., also at the symposium. During the year, the FDIC also continued an internal study of the aftermath of bank and thrift failures from 1980 to1994. This study covers the evolution of resolution and closing strategies used by the FDIC and the RTC, with an emphasis on the approaches used for the larger, more complex failures. It includes case analyses of some of the more notable bank and thrift failures. The study also focuses on asset sales techniques, securitization, equity partnerships, and other innovative methods used by the FDIC and RTC to dispose of the substantial volume of assets once held by both agencies. The study will be published in 1998. The FDIC, through the FRF, is responsible for managing and monitoring assistance agreements that the former FSLIC entered into prior to August 9, 1989. The FRF also is responsible for disposing of all remaining assets and liabilities of the former RTC. The FRF, as successor to the FSLIC, receives federally appropriated funds. In 1994, the FRF was allocated $827 million, which is available until expended. Of that amount, $602 million was still available at year-end 1997. The FRF portfolio of FSLIC assets in liquidation had a book value of $169 million at year-end, down from $476 million at the end of 1996. FRF net liquidation collections totaled $291 for the former FSLIC in 1997. At year-end 1997, the FRF portfolio of assets from the former RTC had a book value of $2.2 billion, down from $4.4 billion at the end of 1996. During the same period, securitization credit enhancement reserves dropped from $5.8 billion to $4.9 billion, and the FDIC, through the FRF, was able to repay $3.8 billion of the $4.6 billion in RTC borrowings from the Federal Financing Bank. The FDIC expects to recover sufficient funds from the RTCs receivership assets to cover the approximately $1 billion in RTC- corporate liabilities remaining at year-end. The FRF will continue to exist until all of its assets are sold or liquidated and all of its liabilities are satisfied. Any remaining funds from FRF liquidation activities will revert to the U.S. Department of the Treasury. For more information on the FRF (click here). institutions, the court may order a defendant to pay restitution to the receivership. The FDIC, working in conjunction with the U.S. Department of Justice, collected more than $13 million in criminal restitution during the year. The Corporation also investigates the circumstances surrounding the failure of every institution and, where appropriate, sends suspicious activity reports to the Justice Department. Six such reports were sent during the year. The FDICs caseload at the end of the year included investigations, lawsuits and ongoing settlement collections involving 182 institutions, down from 244 at the beginning of 1997. This caseload includes RTC cases the FDIC assumed on January 1, 1996.